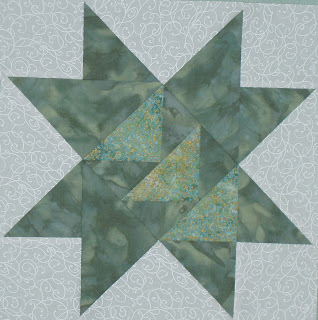 I have issued a challenge to the Members of the online Maple Leaf Quilt Guild. It runs from today until March 6. I currently have 4 finished quilts that do not have labels. My challenge is to get appropriate labels on all of them. I have issued them the same challenge. I am hoping that it will spur some of the members on to action. It's important to label a quilt. You should include as much information as you have about the quilt. I tend to include who the quilt is for, the occasion (IE: birthday) my name and city, date when finished, designer of the pattern (if its not my original work). 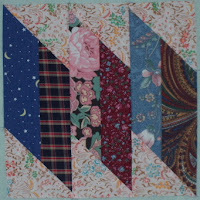 At the same time I try and make a record of all details about the quilt and I like to use the form from The Rocky Mountain Quilt Museum. I put these in a binder and add at least one photo of the quilt. This would also be the time to get an appraisal completed (I have heard that most insurance companies will treat quilts as blankets in the event that you make a claim regarding one). Good luck to anyone one reading this who decides that they have a quilt or two in need of a label. 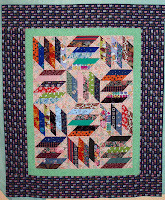 I have been working on the machine quilting of the scrap quilt. Unfortunately I have a few wrinkles in the backing. Do I stop, take them out and then re-quilt, or should I leave well enough alone. None of the wrinkles will affect the wearability of the quilt. So that's one vote for leaving it alone. I suspect that it won't bother my friend that I am giving it to. Another vote for leaving it alone. The big problem is that I will always know that those wrinkles are there. That will bother me every time I see or think about the quilt. This means, I will be taking the stitching out, smoothing the fabric, repinning and finally requilting the affected areas. I need to be happy and satisfied with the projects that I do. I don't rush through them, just to get them done. They have to be artistic completed, not slapped together. Each piece that I deem finished must meet my expectations. No, I'm not a perfectionist (I got over that years ago), but I do want it to be as close to my best work as possible. so, time to stop typing and back to the machine. PS. 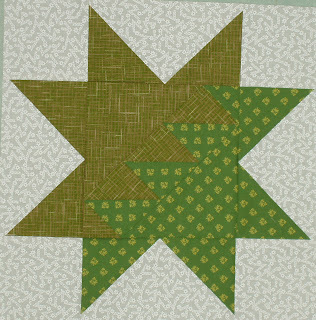 I decided to quilt the middle portion of the quilt in diagonal grid, with stitch-in the ditch along the green boarder and a swirly motif in the outer boarder. It took a bit of concentration, but I now have the quilt top finished. Almost all the fabrics came from 2 boxes of scraps. That includes both boarders. Yes, it is kinda bright and wild, but that can be good during a cold winter night. I bought batting today and tomorrow I plan to finish it all. the backing fabric came out of this seemingly bottomless box. It shall be a real pleasure to surprise my friend. I started sewing on a new project today. A while back, a friend gave me two boxes of leftover fabrics. She invited me to do with them as I wished. Finally I pulled them out and started cutting. There are now numerous stacks of various sized squares and rectangles scattered over my dining room table. For this project I cut 2 x 9 1/2 inch rectangles and 3 1/2 inch squares. For the first step, I sewed 2 of the strips together and pressed the seam to one side. Second step sewed the square to the upper and bottom corners using a stitch and flip technique. The second photo shows the corners after pressing. The third picture shows three of these unites stitched together. This is the 'block'. I will be making 12 blocks. 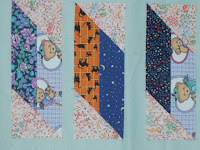 If you would like detailed instructions for this project them please visit Quiltville.com. 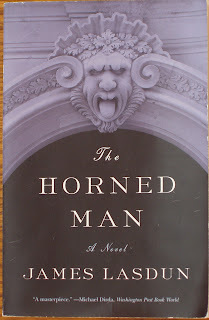 This book found its way to me via a Bookcrossing friend. Nazneen is the main character in the story. She marries at the age of 18 to a man her parents have chosen and follows him from Bangladesh to England. 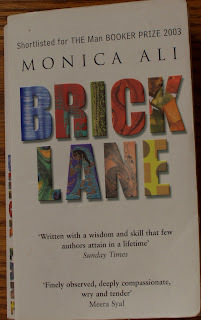 Through out the course of her life in London, Nazneen confronts numerous woman's issues. Similar to many of her new friends, she is in an arranged marriage, which are experiencing varying degrees of success. These can be compared with the love matches of her sister Hasina and of the Doctor and his wife. To work outside the home or not. How to raise and educate the children. In this case, Nazneen has the challenge of raising them to respect a country in which they have never lived. Also to be considered are the Immigrant issues. I see the biggest being whether she has moved to England to become English and remain there or to earn money and move back to Bangladesh at a later time. This becomes a difficult situation for Nazneen as she sees her daughters as being 'English' and realizing that they would not 'fit in' should they return to Bangladesh. The final issue that I find in the book, is that of friendship. Mrs. Islam offers friendship as long as there is something in it for her. Her husband never liked her friend Razia because she is the 'wrong type of person', but in the end, she is absolutely the right type of friend. I enjoyed the friendship between the husband and the Doctor. Somehow each provided what the other needed. It never is stated, but it seems that each has a success that the other has not been able to find for himself. Seems very true to life to me. Prehaps thats why we chose some of the most unlikely people for friends. If any of these topics are of interest to you, then take your time and read this book . These are topics that are faced in many situations, not just by new immigrants. Don't you just love it when you find a book you can totally relate to. Where it feels as though the author must have been reading your mind. This is definitely one of those books. I don't know how she did it, but Judy Martin some how knew that I wanted a book of quilts that use lots of strong and vivid colours and has unusual settings with blocks that go beyond the traditional. The first section of the book is filled with Sampler Quilt pattern, all in sizes ranging from Crib/Wall Quilts up to Queen size bed quilts. The next section is blocks with design suggestions. 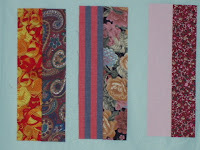 Each of the innovative blocks is shown in at least 4 colour variations and could be used inter-changeably with the other blocks on the same and adjoining pages. Quilt piecing diagrams and size charts for this section are included near the back of the book. 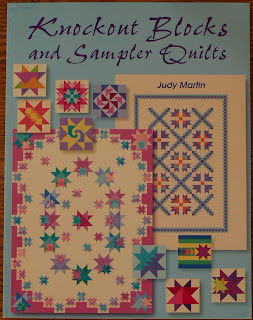 The first block shown to the left is called "Fiery Star" and is on page 67. The second block is called "Shooting Star" and is from page 70. I would recommend that you use Judy's 'Point Trimmer' to cut the points off the triangles so that you can fit them together more accurately. I admit that I love this book. There are so many quilt possiblities contained in it, that I could be kept busy for years without having to buy another book. I was first attracted to this book by the wonderful cover picture. Credits for the cover picture Chin-Yee Lai (design) and Jesi, the Marches, Italy/Bridgeman Art Library. This is a Bookcrossing realease and the previous reader hadn't enjoyed the book very much. Well, to me this now was a challenge. I very much enjoyed the first half of the book. I was able to follow Lawrence, the main character. He's a Professor at a University. He does the Professor type of things. Ok, but then he starts getting odd. Why doesn't he have the lock to his office changed when he realizes that someone is entering it at night and moving and taking items. My understanding of this book would benefit from a chat with other readers. I did glance through the discussion question at the back of the book, which would be perfect for a formal 'book club'. Not having anyone to talk with, I decided that Lawrence is growing a brain tumor similar to the one that killed his father. For what ever reason, the tumour has penetrated through the front of his skull and is now perceived as a 'horn'. To me this is an adequate explanation for his increasingly odd behaviour.